I use to see this happen so after it would drive you insane. It would be a major problem causing some down time and so the solution always was raise the timeout! 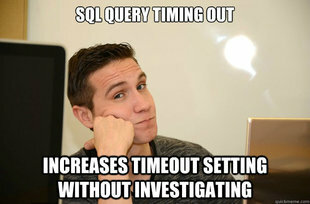 Never was it to look at what was causing the sql to timeout, it was always well raise the timeout shove out the hotfix and we will go back…no one ever goes back. Do it right the first time.